I had purchased a piece of property that might as well have been on a remote island; and False Bluff has no roads, no electricity, no 'grid' of any kind. The nearest of any of these niceties is either El Bluff about eight miles south along the coast or Bluefields about eight miles west over water. A boat was an absolute necessity: first for getting people there and then for getting everything else there. On Nicaragua's Caribbean coast and inland waterways the Panga is the boat most people choose; it's almost the only boat available. Shaped something like a Boston Whaler, Pangas come in different widths and lengths. Although big Pangas can carry tremendous loads, getting the load in and out requires a lot of up and down work. Some of a Panga's most precious cargo is on the way to a birthday party. Since I planned to not travel to False Bluff by way of the Caribbean once our canal was open, at my younger son's suggestion I bought a pontoon boat. A pontoon boat would be ideal for the bay, the lagoons, and the canal. And people and things go on and off a pontoon boat - not in and out, or up and down. Actually I bought a pontoon boat kit. There are a lot of pontoon boat kit companies but taking into consideration not only the cost of the kit itself but the cost of then getting the kit to Bluefields, I was fortunate to find a family business in South Carolina, American Pontoon. Once the proprietors and I had settled on the final design and components of the eight foot wide, eighteen foot long boat, they made the arrangements to truck the kit to Florida where it was then loaded into a container bound for Bluefields. 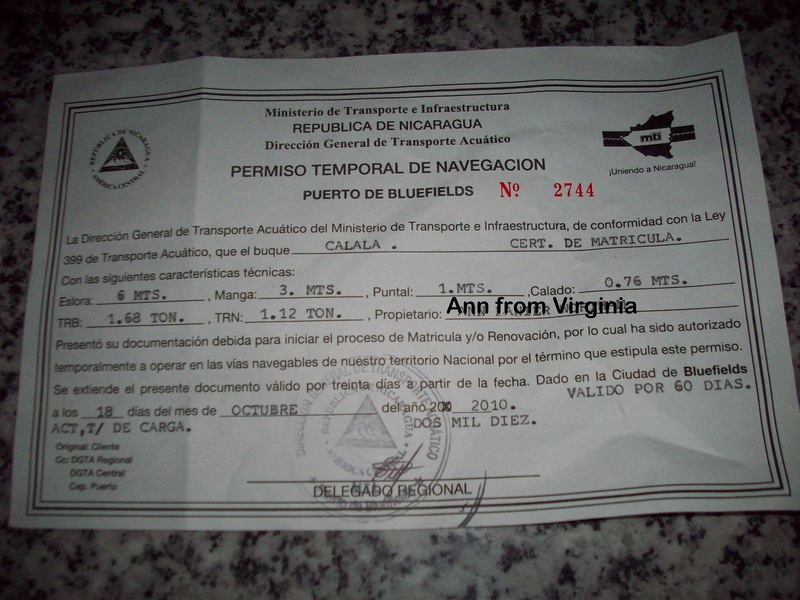 So far there aren't many companies that container-ship to Nicaragua's east coast. The company I used is owned by Gladys Mena who lives part of the time in Miami where her business is and part of the time in Bluefields. Ms. Mena has been shipping materials and 'households' to the Corn Islands for years. The big pieces of the boat kit were unloaded in Bluefields onto a barge and hauled to the wharf near my apartment, just north of the center of town; a pickup truck delivered the rest. We assembled the boat at the edge of the water, propped up and leveled on scraps of wood we found lying around. When it was all put together we shoved the boat right into Bluefields Bay. Before I could use the boat I had to get it registered. The first step of the registration process involves making arrangements for a government employee to come to the boat. He measures and inspects it and does some sort of paperwork, all of which usually takes a couple of days. Once the paperwork's done the boat owner/applicant, you, must then manage to find the employee at his office again and to collect the paperwork that tells you how much the registration fee will be. Then you go to BanPro, one of Nicaragua's two banks, to pay the fee and get the receipt – no, you don't pay the fee in the office where the registration itself is done. And if you don't have an account at BanPro you must take along someone who does. You then return the receipt to the employee at his office who sends it and any additional requisite paperwork to Managua. After an unspecified amount of time you're issued a temporary registration certificate...sometimes two temporary registration certificates if by chance you don't get your permanent-good-for-one-year registration certificate by the time the first temporary registration certificate expires. At least this is how it happens in Bluefields. 'Calala' was the first pontoon boat to hit the water anywhere near Bluefields and even a trip to the gas station is a major event. One of the first trips after the boat was 'legal' was to haul building materials to False Bluff. But before that trip other things had to happen. None of this process is linear.